Chaired by H.E. 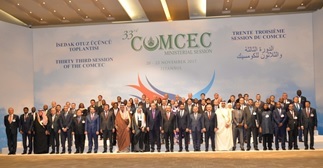 Recep Tayyip Erdoğan, the President of the Republic of Turkey, the 33rd Ministerial Session of the COMCEC was held on 20-23 November 2017 in Istanbul, Turkey. The Session was attended by the delegates of OIC Member States and relevant OIC, regional and international institutions. The Session was preceded by the Senior Officials Meeting, where the delegations of the Member States and the OIC institutions considered and deliberated on a number of agenda items related to various issues of enhancing economic and commercial cooperation among the Member States. Under each agenda item, the Session was briefed on the implemented and ongoing activities of SESRIC towards the realisation of COMCEC Strategy by presenting SESRIC Activity Report which was circulated at the 33rd Session of the COMCEC. Moreover, SESRIC launched the OIC Economic Outlook 2017 report themed on “Industrial Development for Structural Transformation”. The main highlights of the report were presented by H.E. Amb. Musa Kulaklıkaya during the meeting and the presentation attracted significant attention from the representatives of the participating member countries, regional and international institutions. Additionally, SESRIC submitted a report on the results of the “Tendency Survey on SDG Priorities of OIC Member Countries” to the Session. The OIC Member States, who have not been concluded the survey yet, was invited by the Session to complete the survey and send to SESRIC. On the sideline of the COMCEC Session, a side event on “Panel on COMCEC Project Funding” and a series of special sessions was held on the theme of “Transport Corridors”. SESRIC presented the outcomes of its project on “Training Program on the Development and Promotion of Muslim Friendly Tourism in COMCEC Member Countries” and disclose its experience with the potential and existing beneficiaries of COMCEC Project funding during the panel.